Self-adhesive tape adds color and gloss to projects. Chartpak Deco Bright Decorative Tape, 1/8" x 324", Red/Black/Blue/Green/Yellow, 6/Pack - Deco tape offers professional quality and a high visual impact. 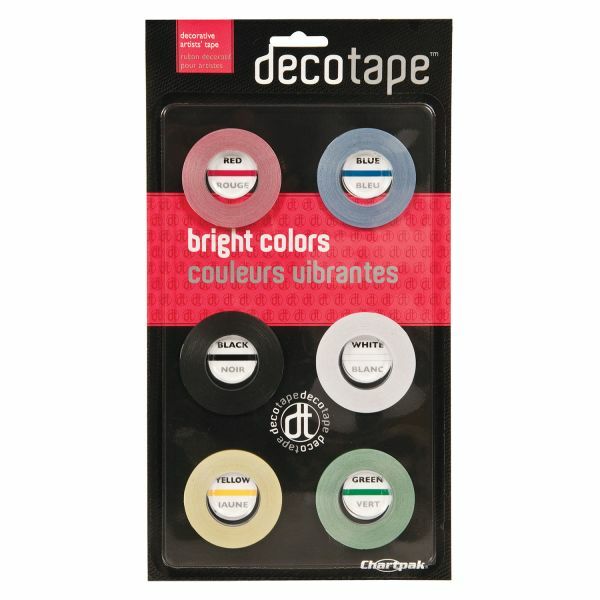 Decorative tape is easy to handle, permanent, self-adhesive and creep-resistant. Assortment contains red, blue, black, white, yellow and green. Use to add color, gloss, shine and sparkle to a multitude of projects indoors or outdoors.